Soulacybin has had a busy 12 months. After the release of the wondrous "Funkerpump" album in December 2014, he has put out a number of compilation releases and completed a US tour schedule. Somehow in there he managed to find time to get a tremendous new album together too. 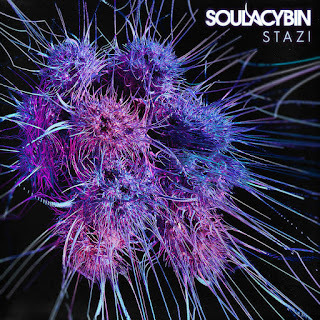 Stazi, his fourth album to date, is now available thanks to Gravitas Records. I remember first hearing Soulacybin's music through his Soundcloud. He uploaded a couple of tracks a few years back and sure made an impression in a quick way. The track I especially remember from those days is Halls Of Amenti a massive slice of psydub/psystep cluster bass. Then came along his debut album "Self Existing Earth" on Ektoplazm. A stunning debut that drew comparisons to Ott, Shpongle and just about any other top level psydub producer you care to mention - and it was available for free ! For free ! It was about this time that I declared him and fellow Ektoplazmer, Globular, to be the new young princes of psydub. How pleasing it is to see them still going strong, evolving sounds with each new release.